Major James Rennell, FRS FRSE FRGS (3 December 1742 – 29 March 1830) was an English geographer, historian and a pioneer of oceanography. Rennell produced some of the first accurate maps of Bengal at one inch to five miles as well as accurate outlines of India and served as Surveyor General of Bengal. Rennell has been called the Father of Oceanography. In 1830 he was one of the founders of the Royal Geographical Society in London. Rennell was born at Upcot near Chudleigh in Devon. His father, John Rennell, an officer in the Royal Artillery, was killed in action shortly after the birth of his son; his mother Anne subsequently married Mr Elliott, a widower with children of his own and unable to care for additional ones, leading to Rennell being brought up by a guardian, the Rev. Gilbert Burrington, vicar of Chudleigh. The ancient paternal Devonshire family name was formerly spelt Reynell and was of French origin. Rennell entered the Royal navy as a midshipman in 1756 at the age of fourteen aboard the frigate Brilliant, and was present at the Raid on Cherbourg (1758), and the disastrous Battle of Saint Cast in the same year. In 1760, he went out to East India, and served in the Grafton under Captain Hyde Parker (1714–1782) during the three following years, when he saw some active service, including a cutting-out expedition at Pondicherry. He soon mastered the theory and practice of marine surveying, and, on account of his proficiency in this regard, Parker lent his services to the East India Company. He served for a year on board one of the company's ships bound to the Philippines, with the object "of establishing new branches of trade with the natives of the intervening places". Rennell accompanied the hydrographer Alexander Dalrymple and drew several charts and plans of harbours on journeys in the Cuddalore (1759–62), the London (1762-63) and the Neptune (1763–64). In 1763, at the end of the Seven Years' War, seeing no chance of promotion, Rennell entered the service of the East India Company's sea service. He at once received command of a vessel of two hundred tons; but it was destroyed by a hurricane in Madras roads in March 1763. Fortunately, his captain was on shore, and he was at once appointed to command a small yacht called the Neptune, in which he executed surveys of what is now called the Palk Strait and the Pamban Channel. Rennell became a good friend of the Governor of Madras, Robert Palk, who also came from Devon. His next cruise was to Bengal, and he arrived at Calcutta at a time when Governor Vansittart was anxious to initiate a survey of the British territory. Owing to the friendship of an old messmate Mr Topham, who had become the governor's secretary, he was chosen for survey duties and was initially commissioned as an ensign in the Bengal Engineers, dated 9 April 1764. Rennell initially surveyed the Ganges river starting in the autumn of 1764, encountering in 1766 the mountains that he called the Tartarian mountains (the Himalayas). The main purpose of the survey was to find a navigable waterway from Calcutta to the northern regions. In the same year Captain Rennell nearly lost his life when the party of surveyors were attacked by sanyasis on the Bhutan border. Injured badly in the shoulder blade, he was taken by boat to Dacca, a journey that took six days. He was treated by Dr Francis Russell and was fortunate to recover although he never gained full function of his right arm. On return Rennell's work was much appreciated and he was recommended for a handsome salary of £1000 a year. Rennell immediately sent money home to his mother and sister while also showing gratitude by sending gifts to Rev. Burrington's children. In 1767 Lord Robert Clive, the then Governor of Bengal and Bihar, appointed him as surveyor-general of the East India Company's dominions in Bengal. After this Rennell was always accompanied by a company of Sepoys. The headquarters of the surveyor-general were at Dacca, and in the successive working seasons he gradually completed his difficult, laborious, and dangerous task. Mapping was accomplished on the field by army men with distances measured using a perambulator - a calibrated wheel whose revolutions were counted to calculate distance - and a compass. Economic pressures further forced a reduction in pay and there was dissatisfaction among the native ranks on the question of double batta (part payment). The surveys were sometimes dangerous, a party of his men were attacked by a leopard and Rennell had to use his bayonet to save his men. Malaria was common and in 1771 he was briefly diverted to military duties in an expedition against a band of raiders. The mapping project was originally a general survey of newly acquired lands, but the job soon gained a wider scope under Warren Hastings, who was appointed as Governor-General in 1773. One of Hastings' first projects was to begin a Domesday style reckoning of property, land, people, and culture for taxation of revenue. As for Rennell's part in this, his project was carried out much like a military survey, searching for safe passage through territory, with information gathering a secondary object. Rennell received the rank of major of Bengal engineers on 5 April 1776, and retired from active service in 1777. The government of Warren Hastings granted him a pension of £600 per annum, which the East India Company somewhat tardily confirmed. The remaining fifty-three years of his life were spent in London, and were devoted to geographical research chiefly among the materials in the East India House. He took up his residence in Suffolk Street, near Portland Place, where his house became a place of meeting for travellers from all parts of the world. James Rennell's map of ancient Egypt, based upon the works of Herodotus. Rennell's first and most influential work was the Bengal Atlas (1779) which was followed by the first detailed map of India (1783), the Geographical System of Herodotus (1800), the Comparative Geography of Western Asia (1831), and important studies on the geography of northern Africa—apparent in introductions to the Travels of Mungo Park and Hornemann. He however forged the geographic data of Park by introducing a mountain range, the Mountains of Kong, supposedly located in the western part of Africa. The fake was intended to support his own theory on the course of the Niger River. The Mountains of Kong remained present in maps until the early 20th century. He also contributed papers to Archaeologia on the site of Babylon, the island of St Paul's shipwreck, and the landing-place of Caesar in Britain. Rennell published a book titled Memoir of a map of Hindoostan (1788) and dedicated to Sir Joseph Banks. Map of the currents in Atlantic and Indian Ocean around Africa, created by James Rennell in 1799. Amazing is the accuracy of the marine currents and winds in contrast to the nearly phantasylike depiction of the inner parts of Africa (unknown to the Europeans until 1877). Beside his geographical and historical works, James Rennell is known today for his hydrographical works on the currents in the Atlantic and Indian oceans. He started his research on these topics when he was travelling by a sailing ship with his family from India to Britain after his retirement in 1777. 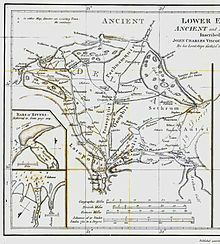 During the extraordinary prolonged voyage around the Cape of Good Hope he mapped "the banks and currents at the Lagullas" and published in 1778 the work on what is today called the Agulhas Current. This was one of the first contributions to the science of Oceanography. He was the first to explain the causes of the occasional northern current found to the south of the Isles of Scilly, which has since been called as Rennell's Current. After the death of his wife in 1810, he returned to the oceanographic topics. His numerous naval friends gave him a mass of data from their logs, which he assimilated into a chart of all currents in the Atlantic Ocean. During his last years, he wrote his last work Currents of the Atlantic Ocean, published posthumously by his daughter Jane in 1832. He was elected a fellow of the Royal Society in 1781; and he received the Copley Medal of the Royal Society in 1791, and the gold medal of the Royal Society of Literature in 1825. James Rennell has been called the Father of Indian Geography, and for his pioneering work on oceanography as the Father of Oceanography. In later life Rennell suffered from gout and in 1829 he fell from a chair and broke his thigh. He died on 29 March 1830 at his home on Suffolk Street. He was interred in the nave of Westminster Abbey, and there is a tablet to his memory, with a bronze bust by Ludwig Hagbold, near the western door. The year of his death saw the foundation of the Royal Geographical Society. His collection of books were gifted by his heirs to the Royal Geographical Society. Rennell was "of middle height, well proportioned, with a grave yet sweet expression of countenance. He was diffident and unassuming, but ever ready to impart information. His conversation was interesting, and he had a remarkable flow of spirits. In all his discussions he was candid and ingenuous". Rennell was however irrational in proposing that the Niger ended in a lake without reaching the sea. He was also strongly opposed to the methods of William Lambton in his proposed trigonometrical survey. His opposition had to be neutralized by Sir Nevil Maskelyne before Lambton's plan was approved. While at Dacca, Rennell became a close friend of John Cartier. It was in Cartier's home that he met Jane Thackeray (d. 1810), daughter of Dr. Thomas Thackeray, headmaster of Harrow, and a great-aunt of the novelist William Makepeace Thackeray and he married her in 1772. Their older son Thomas (born1779) died unmarried in 1846, while the second son William (born 1781) worked in the Bengal civil service and died in 1819 without leaving any children. One daughter named Jane (born 1773) died young, whilst another daughter, also Jane, born in 1777 on St Helena where he had stopped on his way to England married Admiral Sir John Tremayne Rodd, KCB in 1809. Lady Rodd devoted several years publishing her father's current charts and revising new editions of his principal works. She died in December 1863. ^ a b c d e f g h i j Lee, Sidney, ed. (1896). "Rennell, James" . Dictionary of National Biography. 48. London: Smith, Elder & Co.
^ a b c d e Rodd, Rennell (1930). "Major James Rennell. Born 3 December 1742. Died 20 March 1830". The Geographical Journal. 75 (4): 289–299. doi:10.2307/1784813. JSTOR 1784813. ^ Cook, Andrew S. (1981). "Alexander Dalrymple's "A Collection of Plans of Ports in the East Indies" (1774-1775): A Preliminary Examination". Imago Mundi. 33: 46–64. doi:10.2307/1150784. JSTOR 1150784. ^ Anon. (1922). Report on the Palk Manuscripts. London: His Majesty's Stationery Office. p. 167. ^ Thackeray, Sir Edward T. (1900). Biographical notices of Officers of the Royal (Bengal) Engineers. London: Smith, Elder & Co. pp. 11–20. ^ Field, A. R. (1962). "A note concerning early Anglo-Bhutanese relations". East and West. 13 (4): 340–345. doi:10.2307/29754621. JSTOR 29754621. ^ Heaney, G. F. (1968). "Rennell and the Surveyors of India". The Geographical Journal. 134 (3): 318–325. doi:10.2307/1792959. JSTOR 1792959. ^ Rennell, James (1910). The journals of Major James Rennell. Calcutta: Baptist Mission Press and Asiatic Society. ^ Rennell, James (1830). The geographical system of Herodotus examined and explained, by a comparison with those of other ancient authors, and with modern geography. 1 (2 ed.). London: C.G.J. and F. Rivington. ^ Rennell, James (1830). The geographical system of Herodotus examined and explained, by a comparison with those of other ancient authors, and with modern geography. 2 (2 ed.). London: C.G.J. and F. Rivington. ^ Bassett, Thomas J.; Porter, Philip W. (1991). "'From the Best Authorities': The Mountains of Kong in the Cartography of West Africa*". The Journal of African History. 32 (3): 367–413. doi:10.1017/s0021853700031522. ISSN 1469-5138. ^ In his own work "On the geography of Herodotus", he estimated a travelling time of four months for the voyage from London to Bombay by modern sailing ships (in the year 1800). For the return to England in 1777/78 he needed 11 months. Although there was a stopover in St. Helena, where his daughter was born, the voyage had already lasted six months before their arrival there in October 1777. ^ Bravo, M. (1993). "James Rennell: Antiquarian of ocean currents". Ocean Challenge. 4 (1–2): 41–50. ^ Crosthwait, H. L. (1924). "The survey of India". Journal of the Royal Society of Arts. 72 (3716): 194–206. doi:10.2307/41356458. JSTOR 41356458. ^ Pollard, R.; Griffiths, G. (1993). "James Rennell, the father of oceanography". Ocean Challenge. 4 (1&2): 24–25. ^ Johnson, Alison M. (1982). "The Rennell Collection". The Geographical Journal. 148 (1): 38–42. doi:10.2307/634241. JSTOR 634241. ^ Cook, Andrew S. (2004). "Rennell, James (1742-1830)". Oxford Dictionary of National Biography. Oxford University Press. doi:10.1093/ref:odnb/23369. This article incorporates text from a publication now in the public domain: Lee, Sidney, ed. (1896). "Rennell, James". Dictionary of National Biography. 48. London: Smith, Elder & Co.
"Biography of James Rennell from the James Rennel Division for ocean circulation and climate". National Oceanography Centre, Southampton). Retrieved 21 March 2009. Markham, Clements R. (1895). Major James Rennell and the rise of modern English geography. New York: Macmillan and co.
Sandes, Lt Col E.W.C. (1935). The Military Engineer in India, Vol II. Chatham, Great Britain: The Institution of Royal Engineers. Oceanography, also known as oceanology, is the study of the physical and biological aspects of the ocean. 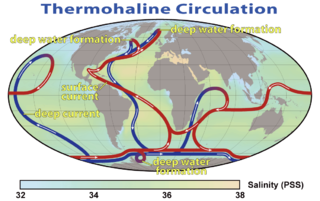 It is an important Earth science, which covers a wide range of topics, including ecosystem dynamics; ocean currents, waves, and geophysical fluid dynamics; plate tectonics and the geology of the sea floor; and fluxes of various chemical substances and physical properties within the ocean and across its boundaries. These diverse topics reflect multiple disciplines that oceanographers blend to further knowledge of the world ocean and understanding of processes within: astronomy, biology, chemistry, climatology, geography, geology, hydrology, meteorology and physics. Paleoceanography studies the history of the oceans in the geologic past. Colonel Sir George Everest CB FRS FRAS FRGS was a British surveyor and geographer who served as Surveyor General of India from 1830 to 1843. He is best known for having Mount Everest, the highest mountain on Earth, named in his honour. Nain Singh Rawat, was one of the first of the late 19th century Indian explorers (pundits) who explored the Himalayas for the British. He hailed from the Johar Valley of Kumaon. He surveyed the trade route through Nepal to Tibet, determined for the first time the location and altitude of Lhasa, and surveyed a large section of the Brahmaputra. He walked "1,580 miles, or 3,160,000 paces, each counted." Colonel Colin Mackenzie CB was Scottish army officer in the British East India Company who later became the first Surveyor General of India. He was a collector of antiquities and an orientalist. He surveyed southern India, making use of local interpreters and scholars to study religion, oral histories, inscriptions and other evidence initially out of personal interest and later as a surveyor. He was ordered to survey the Mysore region shortly after the British victory over Tipu Sultan in 1799 and produced the first maps of the region along with illustrations of the landscape and notes on archaeological landmarks. His collections consisting of thousands of manuscripts, inscriptions, translations, coins and paintings, which were acquired after his death by the India Office Library and are an important source for the study of Indian history. He was awarded a Companion of the Order of the Bath on 4 June 1815. Sir William Wilson Hunter was a Scottish historian, statistician, a compiler and a member of the Indian Civil Service. A Naturalist in Indian Seas, or, Four Years with the Royal Indian Marine Survey Ship Investigator is a 1902 publication by Alfred William Alcock, a British naturalist and carcinologist. The book is mostly a narrative describing the Investigator's journey through areas of the Indian Ocean, such as the Laccadive Sea, the Bay of Bengal and the Andaman Sea. It also details the history of the Investigator, as well as the marine biology of the Indian Ocean. Ocean exploration is a part of oceanography describing the exploration of ocean surfaces. Notable explorations were undertaken by the Greeks, the Egyptians, the Polynesians, the Phoenicians, Phytheas, Herodotus, the Vikings, the Portuguese and Muslims. Scientific investigations began with early scientists such as James Cook, Charles Darwin, and Edmund Halley. Ocean exploration itself coincided with the developments in shipbuilding, diving, navigation, depth, measurement, exploration, and cartography. The Geological Survey of India (GSI), founded in 1851, is a Government of India Ministry of Mines organisation, one of the oldest of such organisations in the world and the second oldest survey in India after Survey of India, for conducting geological surveys and studies of India, and also as the prime provider of basic earth science information to government, industry and general public, as well as the official participant in steel, coal, metals, cement, power industries and international geoscientific forums. The Great Trigonometrical Survey was a project which aimed to measure the entire Indian subcontinent with scientific precision. It was begun in 1802 by the infantry officer William Lambton, under the auspices of the East India Company. Under the leadership of his successor, George Everest, the project was made a responsibility of the Survey of India. Everest was succeeded by Andrew Scott Waugh and after 1861 the project was led by James Walker, who saw the first completion of it in 1871. Major General Sir Andrew Scott Waugh was a British army officer and Surveyor General of India who worked in the Great Trigonometrical Survey. He served under Sir George Everest and succeeded him in 1843. Waugh established a gridiron system of traverses for covering northern India. Waugh is credited with naming the peak of Mount Everest. Sir Richard Carnac Temple, 2nd Baronet was the British Chief Commissioner of the Andaman and Nicobar Islands and an anthropological writer. Major General Francis James Rennell Rodd, 2nd Baron Rennell KBE CB DL JP was the second but eldest surviving son of the diplomat Rennell Rodd, 1st Baron Rennell. The Macrobians (Μακροβίοι) were a legendary people and kingdom positioned in the Horn of Africa mentioned by Herodotus. Later authors place them in India instead. It is one of the legendary peoples postulated at the extremity of the known world, in this case in the extreme south, contrasting with the Hyperboreans in the extreme north. Michael John Robert Fasham, FRS was a British oceanographer and ecosystem modeller. He is best known for his pioneering work in the development of open ocean plankton ecosystem models.